DWQ has collected fish tissue samples for mercury analysis in waterbodies throughout the state since 2000. Since that time consumption advisories have been issued for 24 waterbodies (16 reservoir and 8 river sites). 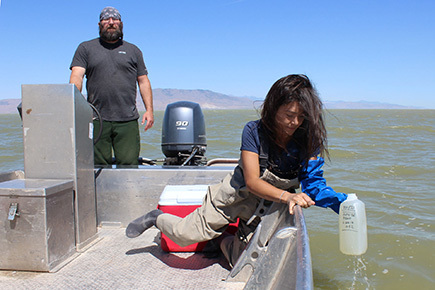 Regional Division of Wildlife Resources (DWR) staff collect fish from locations that are both identified in the sampling plan and that they will already be visiting for their own purposes. All fish are submitted to DWQ by December 1, at which time DWQ staff process samples from fillets and submit them to the EPA Region 8 Laboratory for total mercury analysis. DWQ performs basic statistical analyses on the results including minimum concentration, maximum concentration, mean, standard deviation, p-value and 95% confidence intervals. DWQ currently uses the EPA published ambient water quality criterion for methylmercury for the protection of people who eat fish and shellfish. This criterion is 0.3 milligrams (mg) methylmercury per kilogram (kg) fish tissue wet weight (1). If all fish (small and large) of the same species at a sampling location have a mean mercury concentration of >0.3 mg/kg, additional statistical tests are used to determine if a consumption advisory is necessary. If the mean is <0.3 mg/kg no advisory is issued. In several instances, size class advisories have been issued when it is apparent that only the larger size class exceeds the safe consumption criterion. For locations with a mean mercury concentration of >0.3 mg/kg the p value is considered. The p-value refers to the probability of obtaining a result equal to or greater than those that were measured at that location. DWQ uses a p-value of 0.05 to be 95% certain an advisory isn’t unnecessarily issued. Therefore, if a species has a mean of >0.3 mg/kg and a p-value <0.05 then a consumption advisory is issued. If a species has a mean >0.3 mg/kg but a p-value of >0.05 then an advisory is not issued. The consumption advisories are based on long term consumption, therefore the mean is the most appropriate and commonly utilized parameter to estimate exposure. In an effort to control for false negatives UDWQ calculates 95% confidence limits of the mean mercury concentration. If the upper confidence limit is above 0.3 mg/kg that site is targeted for additional sampling. Consumption amounts are calculated for three target populations including Pregnant Women and Children < 6, Women of Child Bearing Age and Children 6-16, and Adult Women Past Child Bearing Age and Men >16. The current approach for making assessments of aquatic life use support for mercury is different than the consumption advisory process. The assessment is based on the U.S. Food and Drug Administration recommended value of 1.0 mg/kg. The U.S. Food and Drug Administration set the consumption concentration at 1.0 mg/kg, which correlates to the water column mercury concentration of 0.012 µg/liter (L) in previous studies by EPA (EPA, 1985). Utah’s water quality standard for mercury is 0.012 µg/L as a four-day average. Therefore, the corresponding fish tissue concentration of 1.0 mg/kg is used for assessment. Fish consumption advisories for mercury is in place, but the mean fish tissue mercury concentration for all individuals of the same species at a location is less than or equal to 1.0 mg/kg. Fish consumption advisory for mercury is in place, and the mean fish tissue mercury concentration is greater than 1.0 mg/kg. See the Utah Fish Advisories for additional information and the most up-to-date list of consumption advisories.